If you’ve not had a chance to hear this prolific author, master story teller, humorist, songwriter, performer…..well, you get the idea! Now is the moment to experience him at his finest when Garrison comes to the Hershey Theatre for one evening this Fall. 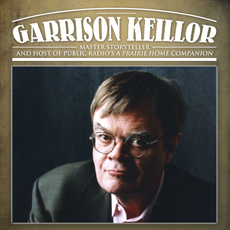 Mr. Keillor began working for Minnesota Public Radio in 1969, and in the summer of 1974 hosted his first broadcast of A Prairie Home Companion. Millions of listeners tune in to his weekly show on over 900 public radio stations and around the world. The author of much prose and poetry, he has penned Lake Wobegon Days (including several sequels), 77 Love Sonnets, Good Poems: American Places, among many other books and articles. His awards number many..among them the Peabody Award for A Prarie Home Companion, the Medal for Spoken Language, a National Humanities Medal, several CableACE Awards and a George Foster Peabody Award. There is so much more to this iconic American, so please drop by his website more information.